Identify 17 terms and definitions pertaining to pulmonary function and disease. Briefly describe the role of oxygen in the human body. Discuss the role of exercise training in pulmonary function. Identify the divisions and basic anatomy of the respiratory system, and the muscles involved with inspiration and expiration. Describe pulmonary circulation and air flow/gas exchange in the human body. 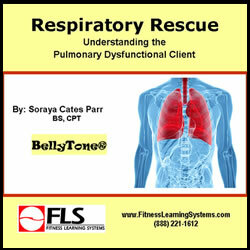 Describe 4 breathing exercises for clients with pulmonary dysfunction. Discuss 12 recommendations for working with clients with chronic pulmonary dysfunctions. Discuss 3 general categories of medication for pulmonary dysfunction, including side effects and effects on exercise. Discuss contraindications and symptoms for exercise termination for clients with pulmonary dysfunction. Describe symptoms and causes of asthma and the ACSM FITT-VP recommendations for individuals with asthma. Describe symptoms, 3 forms, causes, and 8 special considerations for clients with COPD and the ACSM FITT-VP recommendations for individuals with COPD. Discuss four other conditions that can affect the function of the respiratory system. Describe the affects of submersion and hydrostatic pressure, general recommendations, and 8 considerations for aquatic exercise for clients with pulmonary dysfunction.